Type and Characteristics: Diesel-electric cutter, Wind-class, WAGB-280, built by Western Pipe & Steel Co, Los Angeles, CA at cost of $9,880,000, laid down 20 July 1942, launched 8 March 1943, commissioned in USCG 15 July 1944, in USN 13 April 1950 after service with USSR, in USCG 31 October 1966, 6,515 tons displacement, 269ft long x 63ft 6in beam x 25ft 9in draft, 13.4kts, no armament, helicopter flight deck, 219 crew - 12 officers, 2 warrant officers, 205 men. 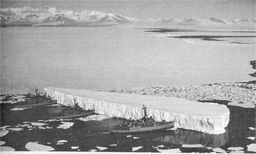 Log Period and Areas of Service: 1950-66, Arctic and Antarctic waters. 15 July 1944 – Commissioned as USCGC Southwind and assigned to the Navy’s CINCLANT (Commander in Chief, Atlantic Command); homeported in Boston, Massachusetts served along the coast of Greenland. In March 1945, transferred to the Soviet Union under the terms of lend-lease; renamed Admiral Makarov, she operated in the Russian merchant marine. 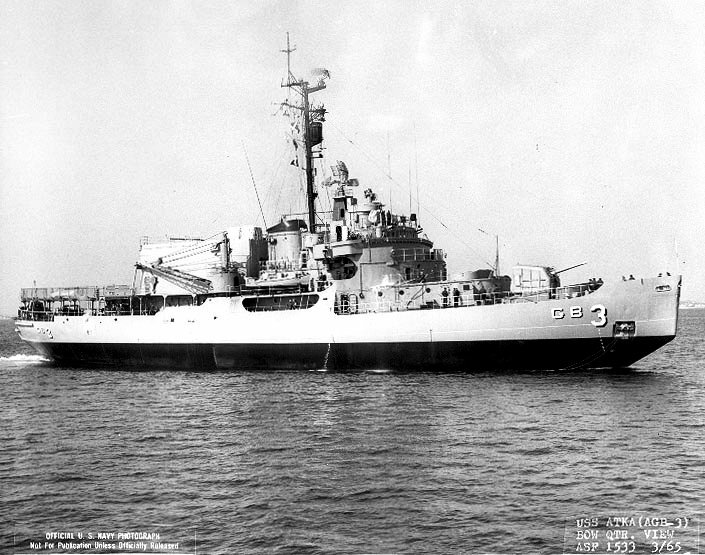 1 October 1950 – Renamed USS Atka (AGB-3) and commissioned by the US Navy, she had a thorough overhaul and modernization at Boston Navy Yard. July 1951 – Began her regular duties in the US Navy. 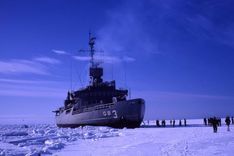 1951 to 1966 – In the late spring, she would set sail for either the northern or southern polar regions to resupply American and Canadian air bases and weather and radar stations. In early fall, she would return to Boston for upkeep and repairs. In the winter, the ship would sail various routes in the North Atlantic to gather weather data before returning to Boston in early spring for repairs and preparation for her annual polar expedition. 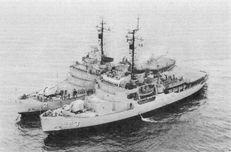 31 October 1966 – Placed out of commission and transferred back to the Coast Guard. 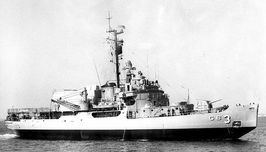 1 November 1966 – Name struck from the Navy List. 18 January 1967 – Resumed her name Southwind. 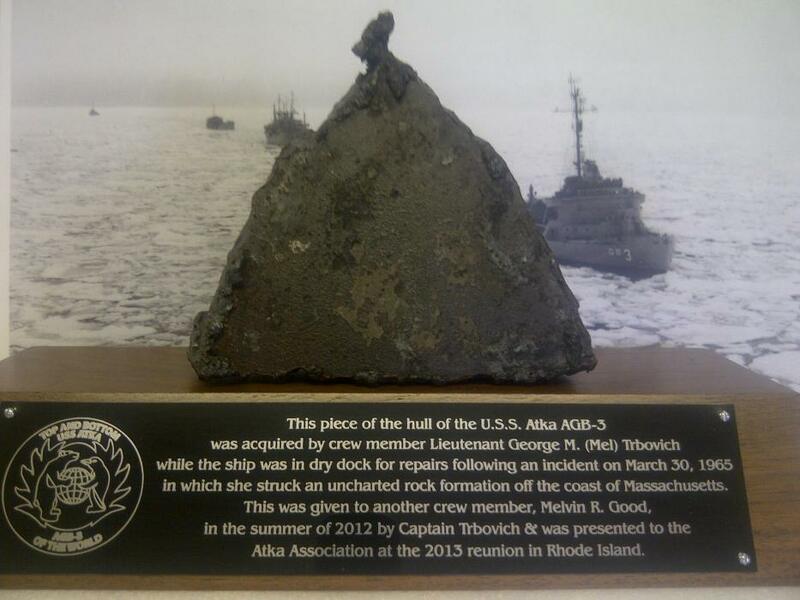 Fate: Decommissioned by USCG 23 March 1945, transferred to USSR 25 March 1945, returned to USA 1949, repaired and commissioned in USN 1950 as USS Atka (AGB-3). Transferred back to USCG as Atka (WAGB-280) in October 1966, but renamed Southwind. Decommissioned 31 May 1974, sold for scrap to New York company March 1976. USS Atka (AGB-3) hove to in Arctic ice. Notice the crew members on the ice, date unknown. 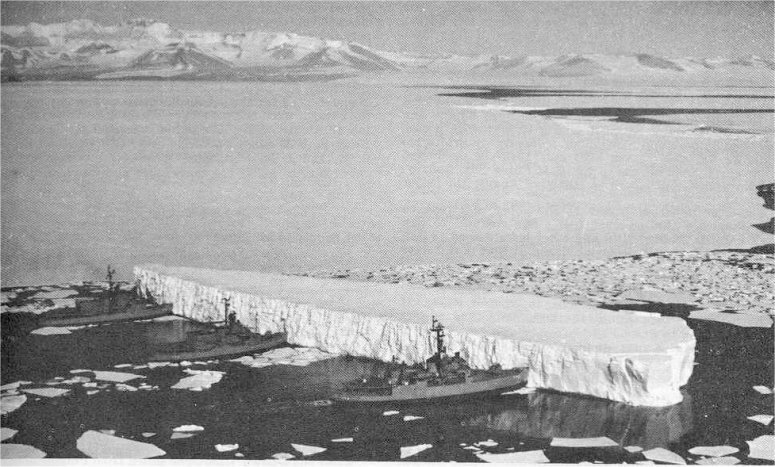 From left to right, USS Burton Island (AGB-1), USS Atka (AGB-3) and USS Glacier (AGB-4) pushing an iceberg out of the channel near McMurdo Station, Antarctica, 29 December 1965.